"Meow," squeaks Jasper in his whiny, high voice so unsuited to a cat his size. He paws at the front door. He clearly wants out. Or does he? 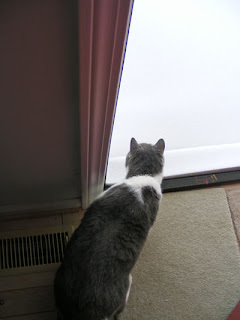 He stretches his head as far out the door as possible to look from side to side. Snow everywhere, even all over the front porch! Brr! I think His Majesty will just spend the day (or two or three) indoors. Hope you are warm and safe wherever you are today!